Summary: The contract involved the installation of 'Free Issue' Arcelor Mittal AS500-12.7 straight web sheet piles, 22.50m long, to form two circular mass gravity cofferdams installed at the end of the existing breakwaters to reduce the width of the existing harbour entrance. Sheet Piling UK Limited were employed by Principal Contractor Van Oord ACZ to design the temporary works and install the ArcelorMittal Sheet Piles to form the Permanent Sheet Pile Cellular Cofferdams. The works were put out to tender in June 2012 with and end of August 2012 contract completion date. 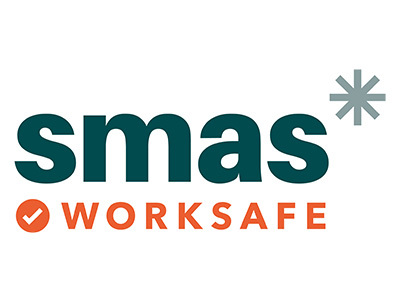 The sheet piling works were to be undertaken in a busy ‘live’ harbour and a tender requirement was that disruption at the harbour entrance was to be kept to an absolute minimum. The harbour is located close to the River Yare Estuary, and strong tidal currents and sea swells were known to exist in this location. 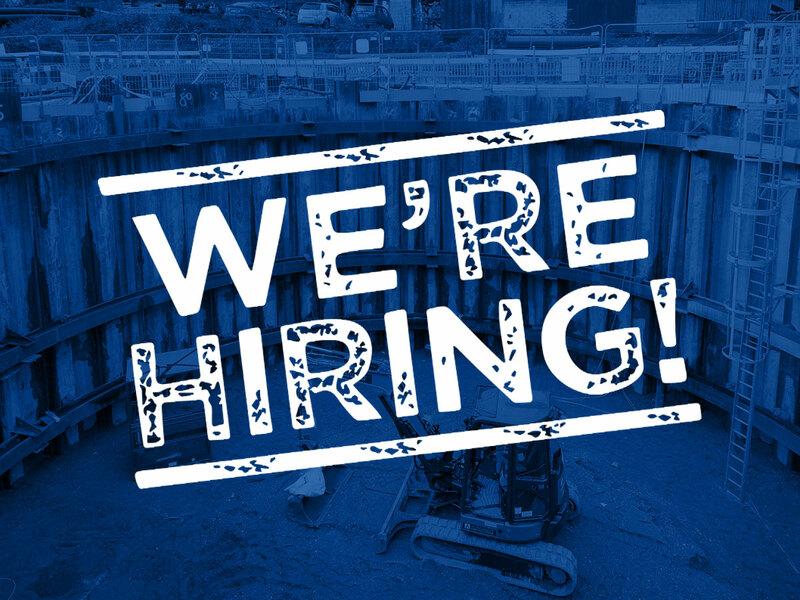 Due to the constraints, Sheet Piling UK Limited elected to adopt a construction method aimed at keeping the marine works elements to an absolute minimum. The sheet pile cofferdams were thus fabricated on the Quayside with the sheet piles being installed around a purpose designed fabricated steel frame. 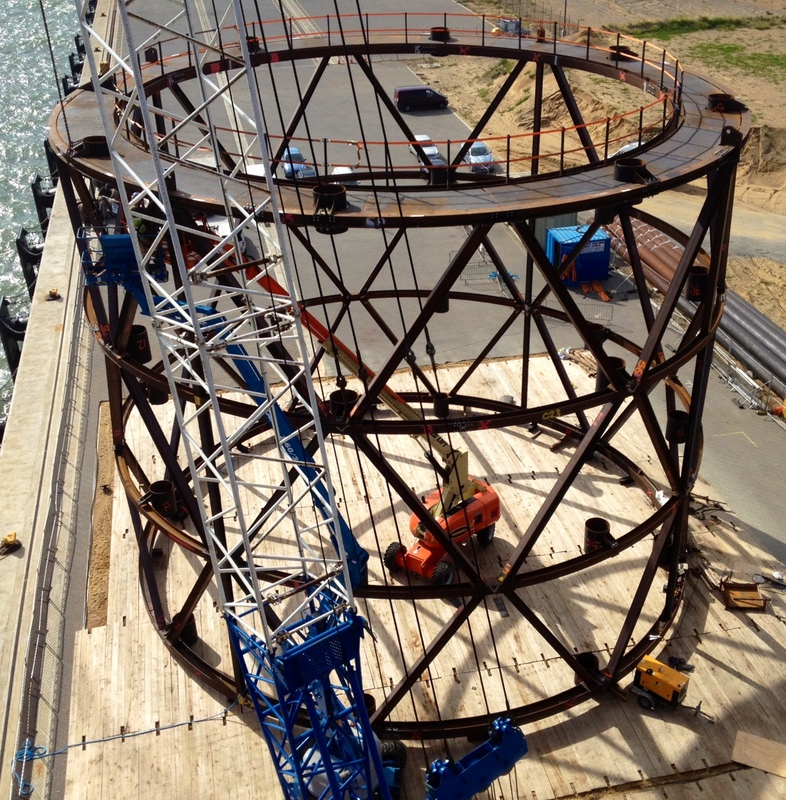 This was designed to resist both wind and wave forces, and also to act as a lifting frame for final positioning of the cofferdam, weighing some 400 metric tonnes. The Quayside was protected and formed to a level area using timber navvy mats. These were used to form a level assembly area for the robust steel temporary works. During fabrication and interlocking of sheet piles on the Quayside, the frame alone was capable of resisting wind loads. However, when placed on the prepared level seabed, it was calculated that 8no 660mm tubular piles, driven some 5.0m into the seabed would be needed to resist the predicted wave and swell forces, and to keep the structure stable whilst the sheet piles were driven and sufficient permanent granular cell fill material could be placed. A land based 130Te Crawler Crane was used to assemble the temporary works and to interlock the sheet piles around the circular temporary works frame. 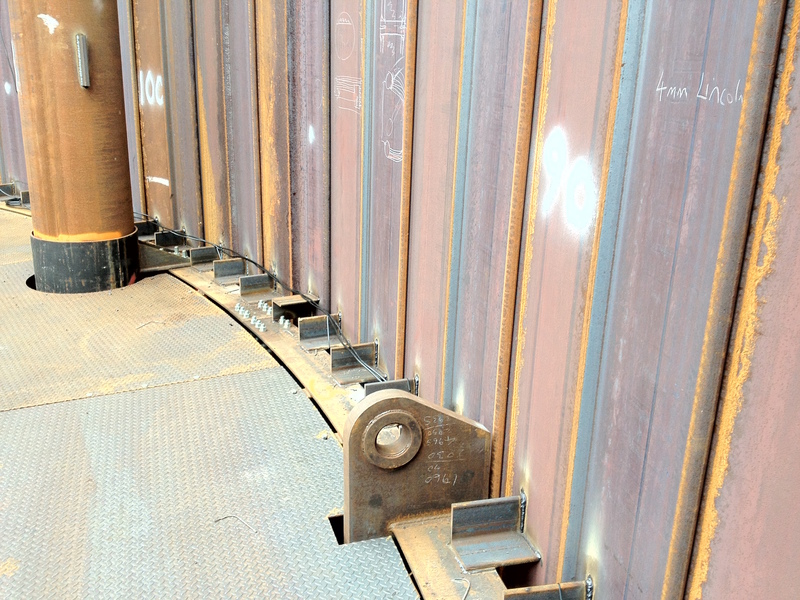 The sheet piles were accurately monitored for position and verticality before being secured to the temporary works via welded steel supporting angles. The eight tubular piles were also prepositioned in the temporary works frame whilst at the Quayside in order to keep to an absolute minimum the time required for completion of marine works at the Harbour entrance. The completed cellular cofferdams, when standing on the Quayside, weighed some 400Te and stood 22.5m tall. A jack-up barge was mobilised to site and the 130Te Crawler Crane was loaded onto the jack-up along with a substantial vibratory hammer and backup percussive hammer. The jack-up barge was then floated out into position some 2.0m clear of the proposed cell location in readiness for driving the tubular and sheet piles immediately the cell had been accurately located. A substantial Shear Leg Crane Barge was mobilised to site and used to lift and position the fabricated cells on the pre-levelled seabed. GPS equipment was used to assist the Shear Leg Barge Master to accurately control and position the cells with the specified tolerance. Once in position, the fabricated cells were lowered to the seabed. The tubular support piles were designed to project beyond the underside of the temporary works frame so as to be the first members to touch the seabed. Once this was accomplished, the tubes were immediately vibrated sequentially into the seabed whilst nominal load from the temporary frame was held by the Shear Leg Barge. Once the tube pile had been installed to design toe level, the crane was detached from the cell and demobilised back to the Quayside. 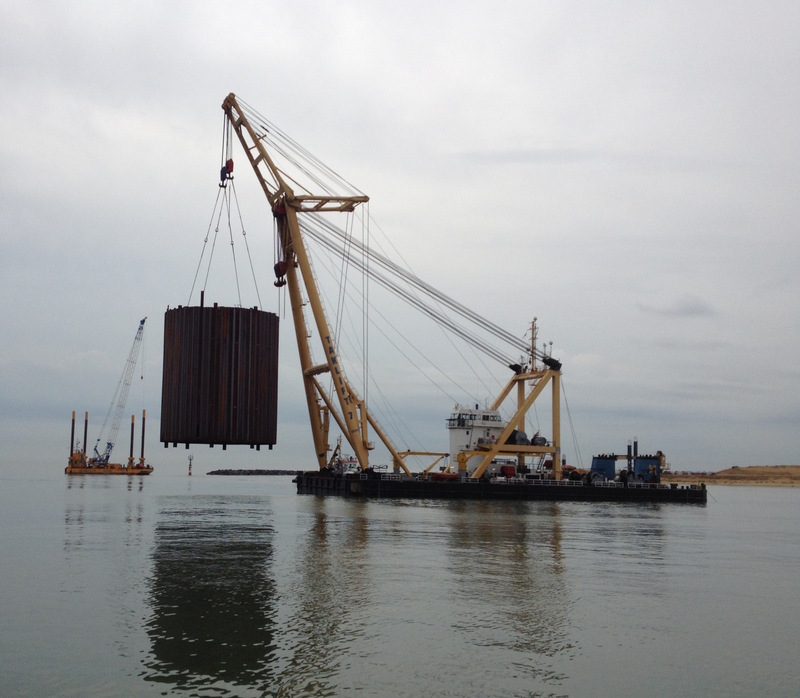 The Jack-up Barge was then used to sequentially vibrate the straight web sheet piles to level. As this stage, the Specialist Sheet Piling Subcontract works was effectively complete and the structure was handed over to Van Oord ACZ who then commenced filling the cells using land based sand pump equipment which had previously been set up in readiness for the fill operations. By use of the above construction methods, both circular cofferdams were completed safely ahead of programme and within budget. The cofferdams were thus fabricated on the Quayside with the sheet piles being installed around a purpose designed fabricated steel frame. This was designed to resist both wind and wave forces, and also to act as a lifting frame for final positioning of the cofferdam, weighing some 400 metric tonnes.